The TALIAFERRO Project, a community act of kindness to honor and preserve the family research efforts of our cousin, Sandra TALIAFERRO. Genealogy contributors will work to “repost” blog entries of San’s originally shared via her "I Never Knew My Father" genealogy blog (now offline). Sandra didn't leave behind children or family to inherit her research legacy. In every way this body of work was her lifeline and that work is unfinished with open questions to answer. The best homage we can pay Sandra, is the commitment and willingness to continue connecting the dots on her behalf. In our quest to tell the stories of our ancestors, the fruits of our labors do not always produce a pretty picture. On occasion, we are faced with a dilemma; do we publish our findings, or just file them away as not for public viewing. A recent discovery presented me with such a quandary; to share, or not to share. I have chosen to share. This is a disturbing newspaper article I recently found on one of my Toliver ancestors. It is not a pretty story. I wish I knew more about the circumstances surrounding the event. What was Minnie thinking? What happened to drive her to take such drastic action, and involve another young relative in the process? These are questions that will never be answered. What happened to Minnie and Laura? The article describes Minnie and Laura as sisters. According to the 1880 census, however, Laura was the daughter of Miles Taliaferro/Toliver (my great, great grandfather), and Minnie was his granddaughter. That would make Minnie Laura’s niece. I believe Minnie was the daughter of Alex Taliaferro, Laura’s brother. I lose track of Minnie after the 1800 census. Laura married Alexander Butler sometime around 1897, and had six children. Laura died sometime after 1930. “Held On The Rail,” The Atlanta Constitution, 29 March 1888, p. 7, col. 1; digital images, Footnote.com( http://www.footnote.com : assessed 14 February 2010), News and Town Records. In genealogy we research to find out the Who, What, When, Where, and Why. Those are the basics. But, if you are like me, you often wonder what everyday life was like for your ancestors. What did they do; where did they go; and who did they see. We know that they had to work and take care of their families; deal with the struggles of day-to-day living. Of course, many attended church and school, and were probably involved in community activities. I am in constant search of anything that can shed more light on the daily life of my ancestors, and their extracurricular activities. I have found that historical newspapers are an excellent source for conducting this type of research. You never know what you might find…..and, as they say, be careful what you ask for. My Taliaferro ancestors have a history in East Point, GA. The WHERE of this story fit with my research facts. Alexander “Alex” Taliaferro was my great, great uncle; son of Miles Taliaferro, my great, great grandfather; brother of my great grandfather John Wesley Taliaferro; uncle of my grandfather John Robert Taliaferro; and great uncle to my father John Lawrence Taliaferro. 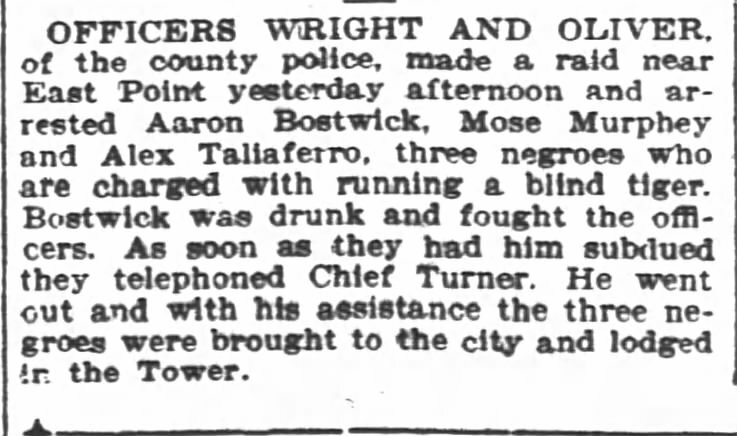 Alex was born about 1858 in Fulton, GA, and died sometime after this 1902 incident, probably in or close to East Point, GA. That’s the WHO and WHEN. But, WHAT in the world was a “blind tiger” and WHY was Uncle Alex running one? I had never heard or seen the term “running a blind tiger” before. A quick search on Google revealed the following definitions: Blind Tiger – a place where illegal intoxicants were sold; Running a blind tiger – selling liquor without a license. So, now I have the WHAT. Uncle Alex and his buddies were selling liquor, illegally!!!! As the old folks say..they were running a liquor house. That really cracks me up, especially considering his brother John Wesley and his nephew John Robert were ministers. All that remains unanswered is the WHY. Why was Uncle Alex selling illegal liquor? Was this a way to make extra money? Probably. Was he just in the wrong place at the wrong time? Maybe, but maybe not. Or, were dear Uncle Alex and his cohorts just up to no good? Possibly. I wonder if I can find out the outcome of the case. Like so many other questions in genealogical research, the WHY will unfortunately probably remain unanswered. At least I know something about one day in the life of my great, great uncle..Alexander “Alex” Taliaferro. I think I’ll go and have a glass of wine (or two) in honor of Uncle Alex! !